This winter has been one of the greyest on record in Germany. Never mind the cold temperatures, it has been the permanent cloud that has really got the population into a depression these last few weeks, with few people venturing out in their spare time. There was really only one exception – the wonderful Bremen tradition of Kohl und Pinkelfahrt in January and February. But yesterday the first sunshine for what seemed like months finally arrived, and today it was even slightly warm. 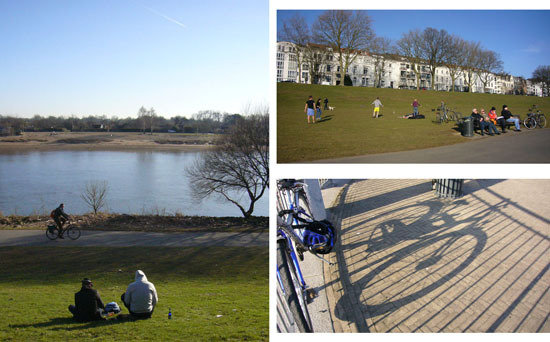 And in Bremen that means that thousands of people, young, middling and old, meet up along the river after school or work, or if they’re lucky earlier in the day, to soak up the joy-giving rays of sunshine. And inevitably, most of them get to and from the river by bicycle. 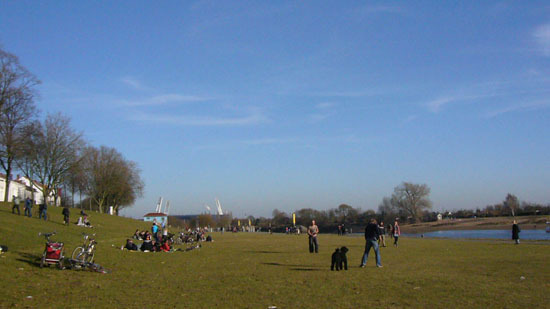 Many people gather in groups on the river dyke to chat, play ball games or have an impromptu drink. Groups like this one, older teenagers, will have cycled at least 2 or 3 kilometres from school, and will be cycling another 3 or 4 kilometres to their various homes. In towns and cities where cycling is not the norm, these events are unlikely to take place. Schoolkids who rely on public transport, walking, or even worse being collected by mama taxi service, find it a real hassle to take such a detour on their way home. But here it is part of the deal that comes with the independence cycling offers. The great thing is that, on days like this, all kinds of people arrive by bike to enjoy the sun, side by side, in their different ways. As we moved along the river, our first thought was that a fair number of people might have arrived by some other means, since we often spotted them without bicycles. But then we watched as individual started to head off home and, almost inevitably, they walked the 30 metres or so to where their bicycle was parked before cycling off. Far more people, it seems, are cycling into the sun today. So as planned we take the train to Schwerin, along with 14 other bicycles. Here we are in the cycle wagon, somewhat full and, contrary to German stereotypes, most bikes have been placed in the wrong space. 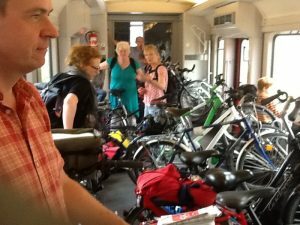 You book a space for your bike on inter-city trains in Germany, but we found ours were already occupied when we got on the train, so had to take someone else’s. Once in Schwerin we decided on an afternoon ride around the large lake; very pretty, and a rather famous grand castle at the start. After 30 kms the rain closed in, so we had a fast peddle back to the hotel. As for cycling infrastructure, cyclists are fairly well catered for on the tourist circuit. Once in Schwerin, things are a bit less so. But in both cases an obvious strategy has been developed. Bearing in mind that the town was until 25 years ago part of the GDR, in that short time a fair amount has been done for cyclists, but based on this expedient of simply converting pavements to shared use cycle/pedestrian routes. The main road into Schwerin has this all the way down into town. As does much of the lake circuit, for example when passing through villages. But the expedient works for two reasons. First, pedestrians expect cyclists. And second, motorists are trained to give way to both pedestrians and cyclists at junctions. It’s not perfect. There was a strategy in place for developing cycling in Schwerin, but it seems the town council have ditched it in May. The German link suggests a familiar experience – politicians apparently listening to local cycling representatives, then suddenly ditching the whole discussion. Be that as it may, Schwerin has its positive points. There is certainly a strong cycling culture here, there are still trams running as I write this after midnight, and the town centre’s pedestrian heart is more fully pedestrian than Darlington. Yes, there are cyclists (though not during peak hours, sadly), but perhaps more interesting is the way in which buses travel through the pedestrian area. Buses travelling at this kind of speed reinforce the idea that this part of the town belongs to the pedestrian, and others are invited. Intriguingly, we watched taxi drivers and a security car driver ignore this concept, suggesting that there is a clear political attempt, via the local bus company, to develop a culture of slow traffic in the town centre. These phenomena – motorists giving way and slow buses- are no god-given behaviours. They are deliberately fostered by political will. The other side of the coin? I leave that to you, the reader, to describe. Last night saw what for me was a remarkable sight – a local authority anticipating the digging up of a road by one of the utilities (in this case water to renew a main sewer), and actually planning to take advantage by developing plans for infrastructure improvements when the work is finished and the road needs relaid. What’s more this is the Viertel in Bremen, an area of the city with higher than normal cycling rates in a city that averages 25%. Our local mayor Robert Bücking, who chaired the event, represents the Green Party that recently won 45% of the vote in our district at last year’s election. Both local government policy and popular will were heavily weighted towards cycling-friendly improvements. Local utility company HanseWasser will begin work on renewing the main sewer that runs beneath Humboldtstraße in April, and last night’s meeting was called to discuss local authority proposals to convert the street into a Cycle Street following completion of the works. Humboldtstraße has a problem that is increasing in Bremen – cycle paths built in the 1980s that are deteriorating, whilst the numbers of cyclists using them continues to increase. Figures released at the meeting last night show that somewhere around 4,000 cyclists use the street daily, a number that is equal to the number of motor vehicles. Humboldtstraße is a residential street, with a series of small local shops dotted along the its 800 metre length. Though no arterial road, it is often used as a handy alternative link between the main city hospital and the city centre. The local authority proposal is to convert Humboldtstraße into a Fahrradstraße (Cycling Street), removing the existing cycle paths, narrowing the main road by a metre, and giving more space to the pavements, and car and bicycle parking. The street will continue as a 30kph (20mph) zone, but unlike now will have priority at all side junctions. Currently, junctions use the “priority to the right” system as an alternative to “give way” signs, but it seems in this case many drivers have historically acted as if Humboldtstraße already had priority over side streets. One principle argument for Fahrradstraße is objective safety. Especially at junctions, cyclists are more visible on the main road when compared with the cycle path. In Germany, cycle paths and pedestrians have priority at side junctions, so any accidents involving a cyclist/motor vehicle collision will almost inevitably be due to the driver failing to see the cyclist. Such collisions are less likely to occur if the cyclist is out on the road. Of course this argument is used regularly by vehicular cyclists in the UK and USA, who have amassed considerable evidence to argue their case. But unlike these studies, the Fahrradstraße discussion last night was primarily concerned with quality issues. How would cyclist priority on the street work in practice? Is the 30kph speed limit respected by all users? What happens at night when there are few cyclists? Clearly on-road cycling here will be quite different to the average UK or USA road. But most interesting of all, concerns from the audience, and women in particular, revolved around subjective safety. Many said they feared any kind of mixing with motorised traffic, and predicted they would instead cycle on the widened pavements promised in the plan. Others questioned whether the role given to cyclists – to calm motorised traffic – was fair on small children or the elderly. 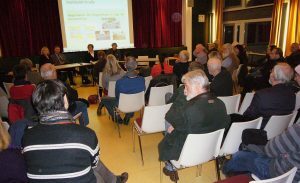 Here, the “experts” from the local authority, the ADFC (German Cyclists Federation), and even one local politician who explained her surprise when she was shown the statistics about Fahrradstraße safety, were unable to reconcile their objective statistics about safety with the subjective feelings expressed by members of the audience. Yet subjective safety is a widely recognised and important concept. In this case, it raises the question about the “feel” of the street for users, and to what extent it is more of a space for slow moving traffic – pedestrians and cyclists – than for fast, or potentially fast-moving motorised vehicles. Many in the audience felt that giving Humboldtstraße continuous priority over all side streets will only encourage reckless driving, despite the speed limit. Humboldtstraße runs in a straight line from one end to the other. These criticisms seemed to suggest a wish for a street design that better stated the intentions of the planners to “tame the motor vehicle”. One woman suggested taking motorised traffic out of the street altogether. Perhaps here there are even some lessons for Bremen from the UK after all. It is gratifying that the public debate last night hardly touched on issues of convenience for motorised traffic. Pretty well all who attended agreed on the aim of making Humboldtstraße a better living street by reducing the dominance of the car (although that pesky issue of parking space remains a popular demand). But if our local authority is to properly address residents’ concerns, a range of options from Fahrradstraße to Fussgängerzone (Pedestrian Zone) should now be explored. 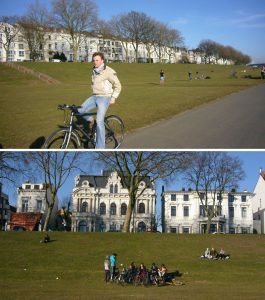 As one attendee said last night, Bremen is going through a deep cultural change, from car-centricity to liveable streets. But the journey from one to the other is not a simple one, and mistakes could be made on the way. In a deeply democratic country like Germany, this debate will continue for some time to come here in the Viertel. We’ll let you know how the proposals develop. With the launch of our new website, our work now turns to exploring the political, social and economic constraints on cycling. We recently published an article in the new magazine Cycling Mobility, which explored the influence of habitus on cycling policies in the UK and Germany. This set us thinking about the many hours of material that were never used in the final production, and how there are many other stories that could be told by these young women. We featured short portraits of Darlington girls Sofija, Kate and Lauren during their visit to Bremen in 2009, but the Bremen girls, and their perspectives on cycling, are just as interesting. They reveal how there is much more to what David Hembrow calls “subjective safety” than has so far been written. And how our understanding of cycling can be so different. Ricarda, one of the Beauty and the Bike girls from Bremen, spoke of “cycling” in the UK not being what she understood as “cycling” at all. We later queried her about this, and she talked a lot about cycling on roads with motorised traffic, whether in a lane or without, as being completely alien to her. 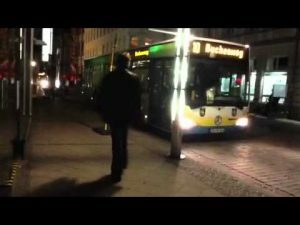 There was an interesting aside about this when we were filming the two groups of girls in Bremen. Ricarda asks Harri what she thought of cycling along a mandatory cycle lane that had recently been developed on Hamburger Strasse. Harri responds by saying how safe she felt. But Ricarda later stated that she prefers to cycle “on the pavement” – this mandatory cycle lane just wasn’t up to the standard that she wanted from cycling infrastructure. Of course Ricarda didn’t actually mean that she preferred to use the pedestrian space we call the pavement or sidewalk. What she was saying was that her idea of cycling was very much divorced from roads designed for motorised traffic. Living in Bremen, it was possible to get around most places without actually using a busy road. Yet here was a bit of new infrastructure that contradicted this vision. The road engineer who worked on this project also hinted that it was a “little bit different” for Bremen to be developing cycling infrastructure on the road – historically, Bremen’s cycle paths have been built, as Ricarda says, on pavements. From an infrastructure point of view, Hamburger Strasse is deemed an advance for cycling. Considerable space was taken away from motorised traffic to create the cycle lanes, and in fact they are often on the pavement as well. 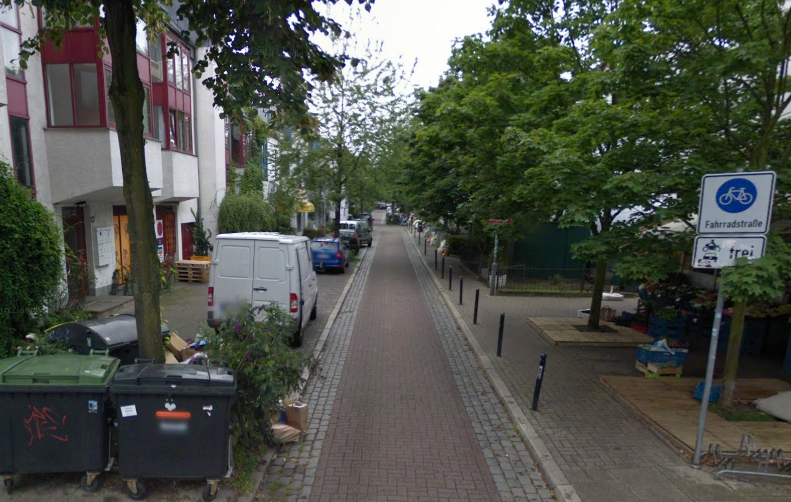 Bremen’s older on-pavement cycle paths are often painfully narrow. But from a cycling culture point of view, it seems like a bit of a backward step to be putting cyclists on a road – albeit with some sense of safety provided by the nature of the mandatory lane. play at look no hands as we cycle along, the possibilities are endless. And a long way away from the health and safety oriented vision of cycling in countries like the UK and the USA. Yet these contrasting ideas about cycling are shaping how cycling develops culturally. I would suggest this is a bit like pedestrians and pavements. In most countries with little or no infrastructure, roads/dirt tracks are shared by all. In most western societies, pavements have developed in urban areas for pedestrians. As pedestrians, we would find it alien to have to share all urban roads with motorised traffic. Bicycling is a different mode of transport, with its own needs, speed, age ranges, that logically does not tally with the very different needs of motorised traffic. Yet certain countries deem it acceptable to continue to insist on cyclists doing just that. Perhaps for consistency, we should begin to rip up our pavements and insist that pedestrians also share road space. After all, some American cities organise their streets in exactly this way. How to best integrate different transport modes requires a clear understanding of the nature of each. To take an obvious example, speed. On urban roads with a 30mph (48km/h) speed limit, average free flowing traffic speeds are in fact just that – 30mph (2009). The average free-flow urban cycling speed in cities with dedicated infrastructure lies between 6.2 mph (10 km/h) and 17.4mph (28 km/h) with a majority of the reported speeds in the literature being between 7.5mph (12 km/h) and 12.4 mph (20 km/h). Average walking speed is about 4mph (6.5km/h). Clearly, any decision to combine two or three of these modes requires careful consideration about the impact one mode might have on others. Thus mixed cycling and walking space is typically designed primarily around the needs of (slower) walkers, with cyclists treated as invited guests. Similarly, mixed walking, cycling and motoring space such as Home Zones are designed to make motorists feel that they are a guest in the street, and must make it difficult for them to travel at speeds of more than 10 mph. In both these cases, priority is given to slower, more vulnerable traffic member. Applying the same principle to mixing cyclists and motorists also makes absolute sense. Thus in countries with a more developed planning approach to cycling, facilities like Cycle Streets are designed as cyclist-priority streets with access for motorised traffic. Similarly, the aim of the 20’s Plenty Campaign is to establish a speed limit norm of 20mph (30km/h) in residential areas, as a means of moving towards streets that again can be used by residents and their children. What is particularly interesting is what happens in residential streets when such speed limits are combined with a strong cycling culture – the subject of our next post. But undoubtedly the great exception to these principles is the mixing of cyclists and motorists on busy 30mph roads. The illogic of this is only sustained as long as the number of cyclists is kept to a minimum, or in some cases legally eliminated altogether. In the vast majority of towns and cities where this is the norm, cycling numbers remain stubbornly low. Dutch style infrastructure, as currently being considered by London Cycling Campaign, and advocated by both Darlington and Newcastle Cycling Campaigns, as well as a host of other online commentators, means good quality cycle paths alongside busy arterial roads. Without this key strategic understanding, all the well-funded work going on around 20mph speed limits, cycle training, the marketing of cycling as healthy, and so on will have little effect on the levels of cycling in countries like the UK. “Cycling”, as understood by Ricarda in our film, will continue to be a pipe dream.